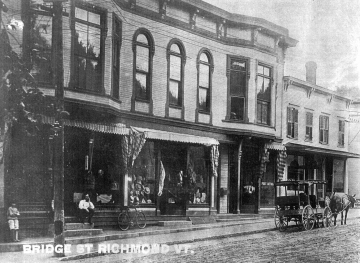 A caption at the bottom of the historical image reads, "Bridge St. Richmond, Vt." The image shows businesses and a sidewalk along a dirt street. 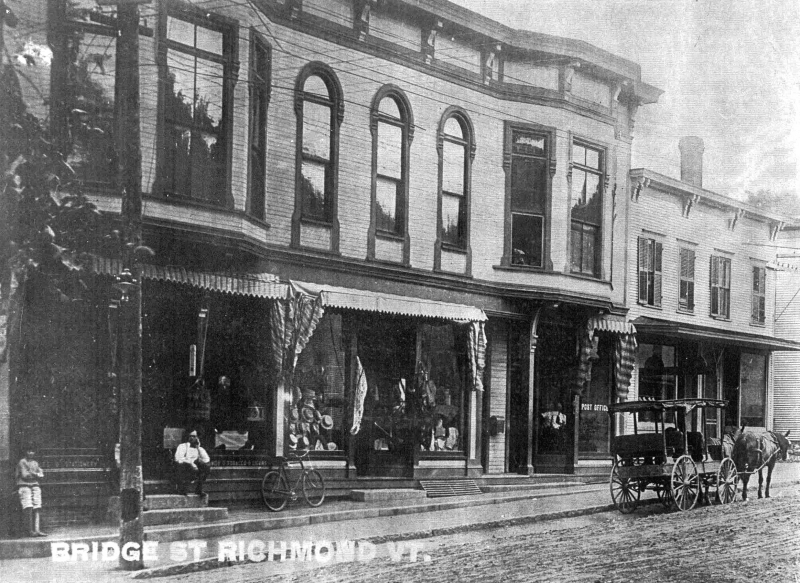 A horse pulled-wagon is parked in the street. There is a utility pole with electric lines on the left side of the photograph. There is a boy and a man in front of the business on the left side of the image. A bicycle leans against the shop window. There are hats displayed in the window of the next shop. The words "Post Office" are printed on the window near the next entryway. Mo Humphrey writes on 2018-04-19: This image is from a postcard and was recently colorized by TD Bank. This building is the Masonic Block and was built in 1891 and destroyed by fire in 1908. The smaller building to the right is called the Gleason Block. I'll try to load in the colorized version. One-over-one windows. Utility lines. Horse-drawn carriage.